I'm not sure while I'm so perpetually drawn to the wonderful cuisine of Italy.....sure, I've been there....but I've been other places too (and to be frank, it's hard to compare what comes out of my kitchen to what you eat in the real italia...holy yumminess). Anyway, for dinner on Friday, I wanted to have something that would be quick and easy and that would not be asian in origin. My dad was over for dinner, and he's just returned from months in Thailand....so I wanted something that would be very different than the food he'd been eating lately, but that would also be quick and easy for a weeknight. Have I mentioned before just how much I adore Italian food? There's something about al dente pasta, garlic, fresh herbs and grated parmigiano.....it's ridiculously easy to make, quick to put together and just so satisfying. 1. Put a large pot of water on to boil for the pasta. 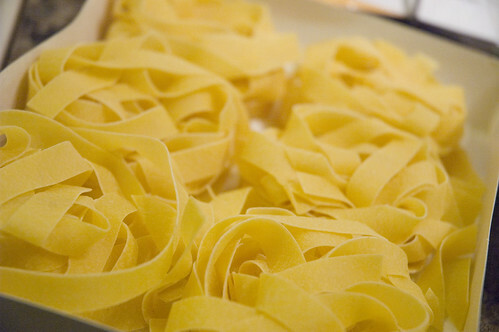 When it comes up to a boil, salt the water, drop in the pasta, and cook to al dente. 2. While the pasta is boiling, season the chicken with salt and pepper. Heat a large nonstick skillet with 2 tablespoons extra-virgin olive oil, 2 turns of the pan, over medium to medium-high heat. Add the chicken to the pan and brown lightly on both sides; remove to a platter and cover with foil to hold in heat. 3. To the same skillet, add 2 tablespoons more extra-virgin olive oil and 1 clove garlic. Cook garlic a minute or so, then add the mushrooms. 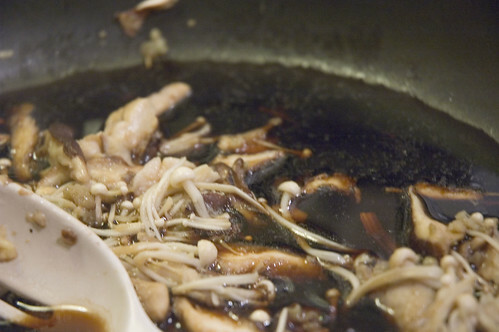 Let the mushrooms brown evenly and become tender, 8 to 10 minutes. 4. While the mushrooms work, start gravy for pasta. In a deep medium skillet melt 2 tablespoons butter over medium heat. Add a clove of crushed garlic and cook a couple of minutes then remove. Whisk flour and tomato paste into garlic infused butter. Cook the flour a minute or 2 then whisk in the stock. 5. Add rosemary and Worcestershire sauce. Simmer to thicken, 5 minutes. Season the sauce with salt and pepper, to your taste. 6. 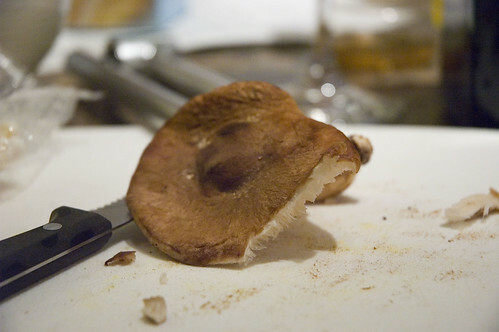 To the cooked mushrooms, add capers and Marsala and reduce a minute or so. 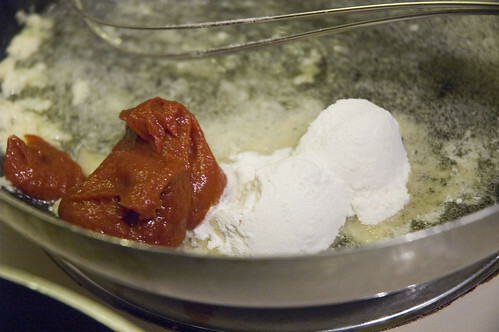 Add 2 tablespoons butter in small bits to finish sauce and shake the pan to incorporate. Slide the chicken back into sauce and warm. 7. Drain pasta and toss with sauce and a handful of cheese. Serve pasta alongside Chicken Marvalasala. 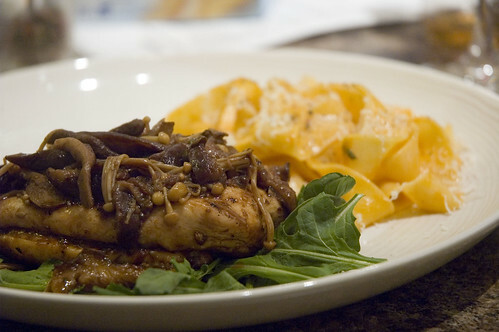 Scatter arugula or spinach across both the chicken and pasta, to garnish. The pasta recipe was surprisingly yummy good - I would definitely double the sauce and serve with something like a roasted veggie pasta. It's pretty healthy(ish) and has loads of tasty flavour. Yum! Hi Leslie, it's Erika! That looks like a great recipe! You'd have to actually watch Rachel Ray's show to know why people don't like her. I like her recipes, but she can get annoying pretty quickly! As for tomato paste in a tube, I found some in a Loblaws, so the Superstore should have it with the other tomato pastes. If not, Nicastro's would be my first stop (and if they don't have it, there's a problem...). I found mine at Food Basics. It is right by the tomato paste in a can it's Alpino brand and it's a tad pricier $1.49 but far less wasteful. Like Erika said, it's mostly Rachael Ray's personality rather than her recipes that bug people. She can be pretty grating. She likes to use her personal catch phrases like saying 'EVOO' instead of 'Extra Virgin Olive Oil' and 'Yumm-o!!' when describing tasty food. However, I do have to say that I respect the fact that at least she admits she is not a professional chef. She has no chef training; all her cooking skills were learned at home from her family. She refers to herself as a cook. La Bottega in the market has a few kinds of the tomato paste in tubes available. So much fresher tasting than the tinned kind. 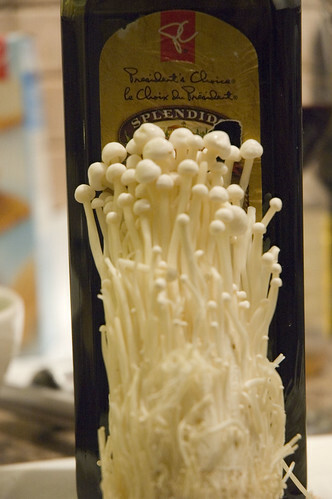 An Italian dish with asian mushrooms. Sounds really tasty.